Releases like this are the reason I love hearing demos and self financed albums. 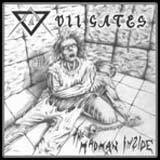 The Madman Inside is the third Demo recorded by this six piece band from Sweden. Let me stop right there for a moment. Why is this band still recording demos? This is a damn good band that has distinct influences, yet also has its own unique sound. The band plays melodic heavy metal with mature song writing and excellent musicianship. I fully expect this band to sign a record deal with a major (in terms of the metal genre) label and for me to be reviewing a full length debut in the coming year or so. There is a lot to like with this band. First of all, the vocalist reminds me of a cross between the vocalist for Heavens Gate and the vocalist for Crystal Ball. Christer Elmgren is nothing less than a perfect fit for this band. He colors the songs very well with his emotional and melodic voice, reaching and sustaining the high notes with ease. His voice also helps direct the chorus lines directly into your mind, destined to stay there for quite a long time. Guitarists Jonas Arvidsson and Robert Makek make a great team on guitars. These two seem to know exactly what the other is thinking and remain perfectly synchronized throughout the album. The riffs and rhythms are very strong, and the solos are exciting and memorable, but not over indulgent. The keyboards help the band achieve a big sound on this CD, a sound all their own. The first track, The Saviour even features an accordion, giving the song an instantly recognizable melody and atmosphere. So Far Away, Tormented, and the title track feature the tasteful use of piano parts, ala Edge of Thorns by Savatage. I can tire pretty easily of excessive piano and keyboard parts in my music, but VII Gates are masters of songwriting in that each musical element meshes together like a jigsaw puzzle to deliver a fantastic listening experience. Balance and variety seem to come naturally for these guys. Each of these songs is packed with power, emotion, and melody, which come together in grand fashion to form the perfect "grand finale" for this CD. The CD closes with the epic title track: The Madman Inside. What a brilliant song! This variation of this track is testimony to the fact that these guys are top notch songwriters. Tempo changes, rich melodies, and dynamic keyboard/piano textures make this song the standout of the disc although there are no weak tracks to be found. There is simply not a boring, nor a predictable moment on this CD to speak of. For a demo, The Madman Inside has exceptional production. I'm sure the final output sounds exactly as the band intended for it to sound. All instruments are at the proper level, and the sound is very crisp and professional. I am quite impressed by the band's ability to pull some of the best traits from their many influences and produce a sound all their own. You simply cannot accuse this band of being a copy cat. Creative and thoughtful songwriting combined with above average musicianship and professional production make this surprising demo an easy recommendation. Fans of quality melodic metal should absolutely give this band a chance. In the promo package I received for this release, the band stated that they have been having problems with their homepage (linked above). At the moment I cannot access it. However, I was able to find <this site> which will give you some information about this band and will allow you to download some of the tracks from this very promising demo.